Having Problems with your Online Content? Q: What is online Content? Q: How can I view my online content? Select My Account at the top of the screen and then Student Tools. Click the Launch button next to the content you want to view. You may have the option to take an online tour to view the content options you have in your Student Dashboard. Click on the information icon to view the tour. Note that if you are enrolled in more than one course, you can return to your Student Tools list and Launch another Student Dashboard. Q: How can I navigate through my online content? Your Online Content may have some or all of the Tabs shown below. 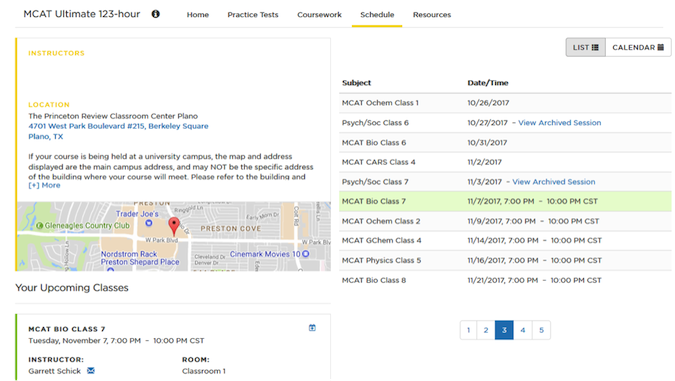 See the Online Tour details for more information about your course – or take the tour in your own Student Dashboard! Q: What requirements must I meet to access my online content? All modern browsers should allow full access to your online content. No special software or downloads are required. Q: Where can I download the latest version of my browser? Most modern browsers are set to automatically update when needed. However, if you need to manually update your browser see the links below. Note: Microsoft Edge The Microsoft Edge browser is a part of Windows 10 and consequently, so are its updates. In the Internet Options window, select the Security tab, and select the Custom level… button. In the Security Settings window, scroll down to Scripting and click the Enable button for Active scripting . Click the three-dot menu icon to the right of the Address bar and select Settings . Open a new tab, and then, in the address bar, type about:config. You'll see a "This might void your warranty!" warning. Click I'll be careful, I promise! to continue. When you're finished, close the "about:config" tab. On the web browser menu click Safari and select Preferences . In the Preferences window select the Security tab. Q: How do I enable Cookies? Click Tools and then Internet Options . In the Internet Options window, select the Privacy tab, and click the Advanced button. In the Advanced Privacy Settings window, select the Override automatic cookie handling checkbox. Select Accept for First-party Cookies and Third-party Cookies . Select the Always accept session cookies checkbox. Click OK to close the Advanced Privacy Settings window. Scroll down to the bottom of the menu and click View Advanced Settings. Click the hamburger icon to the right of the Address bar and select Options . In the Options enter cookies in the search field. Check the box next to Accept cookies from websites. In the Preferences window select the Privacy tab. Click the Allow from websites I visit option. Q: How can I download Adobe Flash and Adobe Reader? Q: How do I disable my browser's Pop-up Blocker? In the Internet Options window, select the Privacy tab. Under Pop-up Blocker , click the Settings button. In the Pop-up Blocker Settings window, enter the address "www.princetonreview.com" and click Add . Type Popups into the Search field. Under Pop-ups Click Add and enter the address "" and Click Add. In the Options enter pop-up in the search field. Click Exceptions next to Block Pop-up windows. Enter the address "www.princetonreview.com" and click Allow. Uncheck Block pop-up windows . Q: What if I see unwanted pop-ups or ads? If you see pop-ups or underlined words on the page that look like links they may actually be embedded advertisements. First, run a virus scan to make sure that the problem exists in your browser. You can also check to see if there is a search accelerator or download manager extensions installed on your computer and, if possible, disable these types of extensions. If the first two options don't stop the pop ups, check your Internet Service Provider service agreement to see if they modify website pages to include third party ads as a way generating revenue. Q: How can I change my username/email address? Just remember: the next time you log into the website, you'll want to use your new email address to log in. Just remember: the next time you log into the website, you'll want to use your new password to log in. Q: How do I change my email subscriptions? 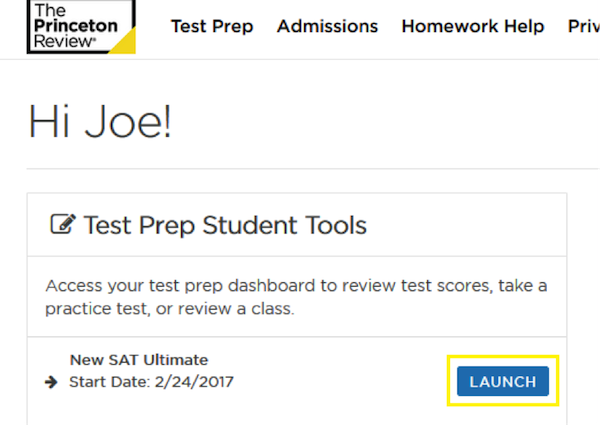 Princeton Review students may have access to online content that supplements their courses, tutorials, or book purchases. Depending on the course you are enrolled in or the product you have purchased, this content may include full-length tests, practice drills, online lessons, or other supplemental material. Q: How do I find out how I did on my test? Click the Launch button next to the course you want to view. 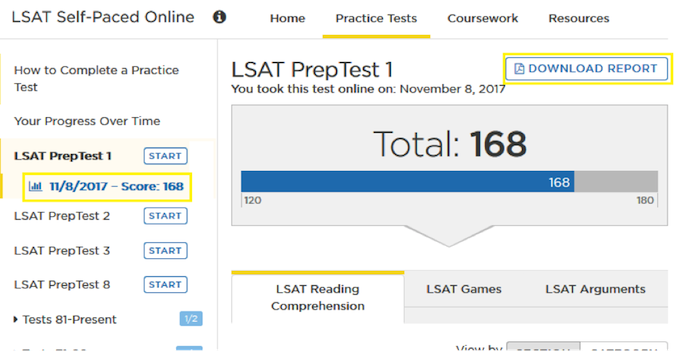 Click Practice Tests and view your scores listed under each test listing on the left navigation pane. To view your score report, click the "View" link for the appropriate test or drill. Q: When is my next class? If necessary, enter your username and password and click "Login"
If you are taking a course in person, clicking the Schedule button brings up a detailed course schedule with location information. 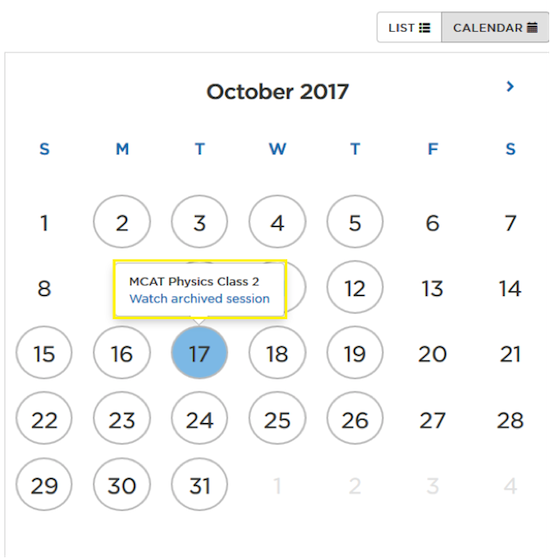 If you are a LiveOnline student, you can find links to your scheduled class sessions, available 15 mins before the scheduled course time, and to recorded sessions, posted after the live session has completed, in this window. Q: How can I score my tests? 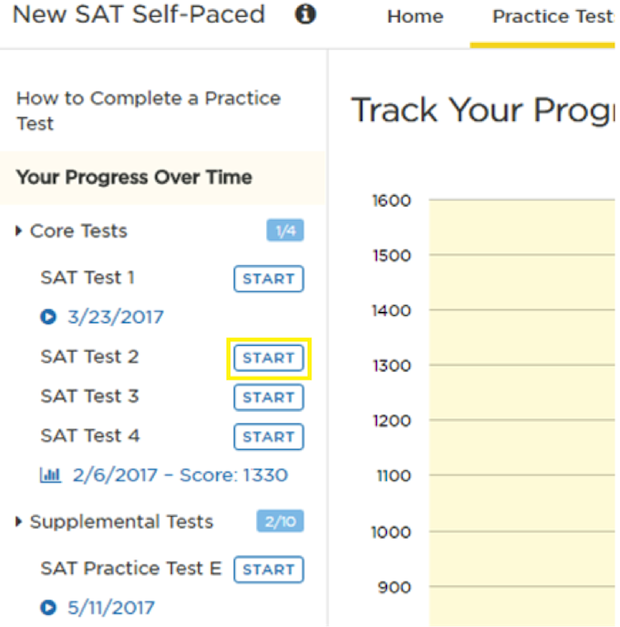 Click Practice Tests and click Start next to the test link you’d like to score. If you must pause entering your answers, you can resume entering answers at any time by clicking on the resume link listed below your test. Q: How can I take my online tests? Q: How do I print a score report? Click Download Report above your Online Score Report. Click Print button on your downloaded score report. Q: How do I find a course or tutor in my area? To find a course or a tutor in the U.S. or Canada, click on the test you are interested in prepping for from our homepage, www.princetonreview.com, and enter your zip code. Then select the course or tutoring offering you are interested in to learn more. Q: How do I contact my local course office? To speak with a staff member at your local TPR office, call 866-TPR-PREP. Q: Why are there no classes listed for my area? Princeton Review offers classroom and tutoring programs in most cities across the U.S. and Canada. However, if you can't locate a course in your area please explore the various Online course options. This could take the form of our LiveOnline courses, taught by an expert instructor, or the form of an Online only course, which offers the content but doesn't involve any instructors. Q: How long will I have access to my course for? You can view the length of your online entitlements right in your student portal page. 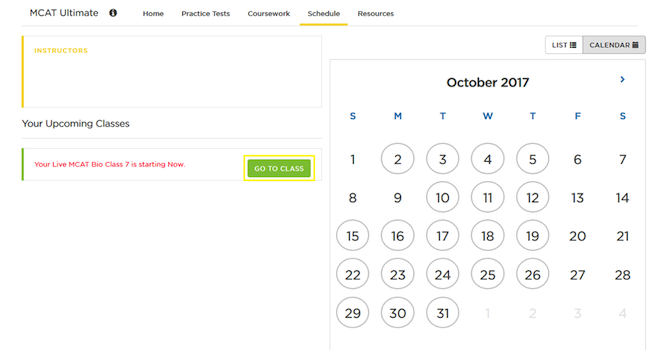 The dates that your course is available to you displays right next to the "Launch" link in "Test Prep Student Tools". The Access Expires notification goes from green to red when there are less than 30 days left in the course. Q: How can I extend my course? If you are interested in extending your course access, please contact 888-955-4600. Q: Can I retake an online practice test? Absolutely! 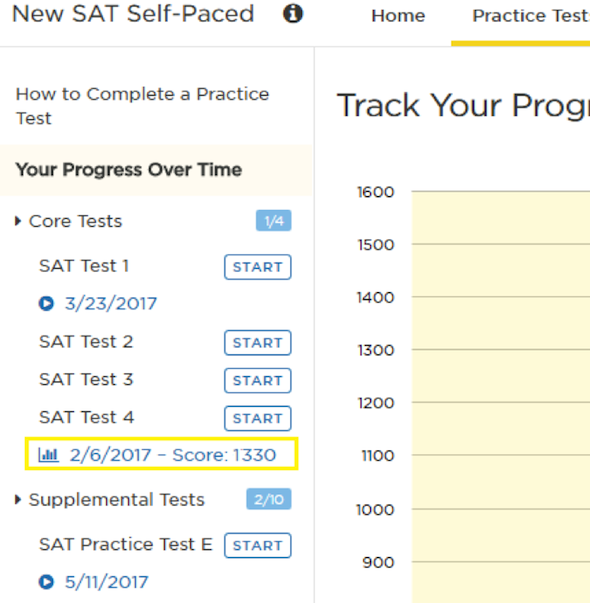 You can retake your online practice tests as many times as you like, and each time you take the test will produce a new score report. Our GMAT tests are an exception to this rule. In order to retake a GMAT test, you will be forced to delete the scores on the previous exam. However you will still be able to view the test’s score report after deleting.